Cormous perennial with up to 4 lance-shaped leaves, to 30cm, a slender flower stem, to 60cm, usually branched and bearing up to 7, lilac, pink, mauve, violet or red-purple flowers in spring or summer. A variable species and descriptions in the literature are correspondingly variable. [RHSD, CECB]. 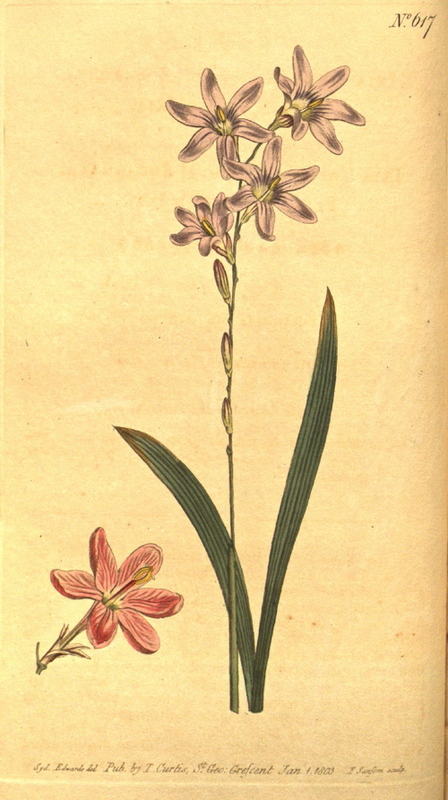 ‘[Ixia capillaris var. aulica] is a mere variety of [Ixia capillaris], though made a distinct one in the Hortus Kewensis, under the name of aulica.’ [BM t.1013/1807]. Ixia capillaris var. gracillima, synonym I. aulica, is also figured. Pale blue-lilac and pink forms are illustrated. The paler forms shown here bear a greater resemblance to the Blarney plants (see notes), which are very pale mauve or lilac, or white. [BM t.617/1803]. Introduced to Britain in 1774. [JD]. Listed in all published catalogues [B.268/1843]. A form of Ixia capillaris is naturalised in the area of the Camden Park garden called ‘Blarney’, a grassed slope left unmown for all but the summer months. This is probably the variety aulica. Ixia flexuosa grows alongside Ixia capillaris but in much smaller numbers and more localised. Sparaxis bulbifera, Sparaxis tricolor, Romulea rosea and Oxalis bowiei are also naturalised here together with a smaller number of Gladiolus carneus, many narcissi, mostly tazettiforms, and two mature bulbs of Brunsvigia josephinae. In a good season the spring bulbs are an impressive sight.